Will we be losing Black Family Reunion mural? When Douglas Jemal and his development group announced recently that they would be putting up a 30 unit apartment building with ground floor retail at the empty Latino Auto Sales, I shrugged. That block seems to be housing/ground floor retail central – and the ground floor retail is failing. No stores have opened in the View 14 or Solea buildings. But when I read more closely, I saw this building will be 6 floors – meaning that the Black Family Reunion mural on the adjacent building will be obscured. Under current plans at least, it seems the project will go forward without accomodating the mural. The good news is that Jemal will be working with the artist, Byron Peck, (who also did the famous mural of Duke Ellington on U Street) to create a new mural in lieu of the Black Family Reunion one. Glad that the developer is willing to work with the artist, but still sad to see that this great example of community created street art hidden. Construction will not start until summer 2011 (optimistically) so you still have plenty of time to admire the mural. 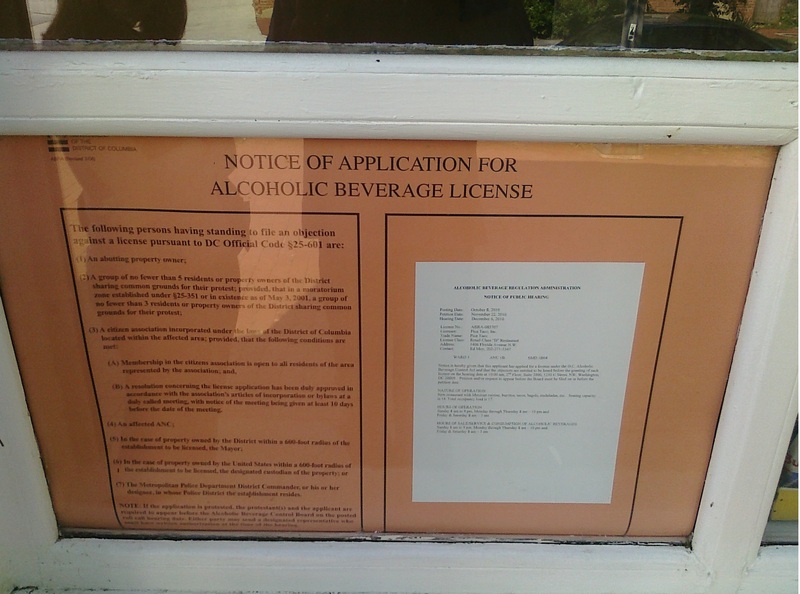 Good to see that Pica Taco (14th/Florida) is doing well enough to apply for a liquor license. 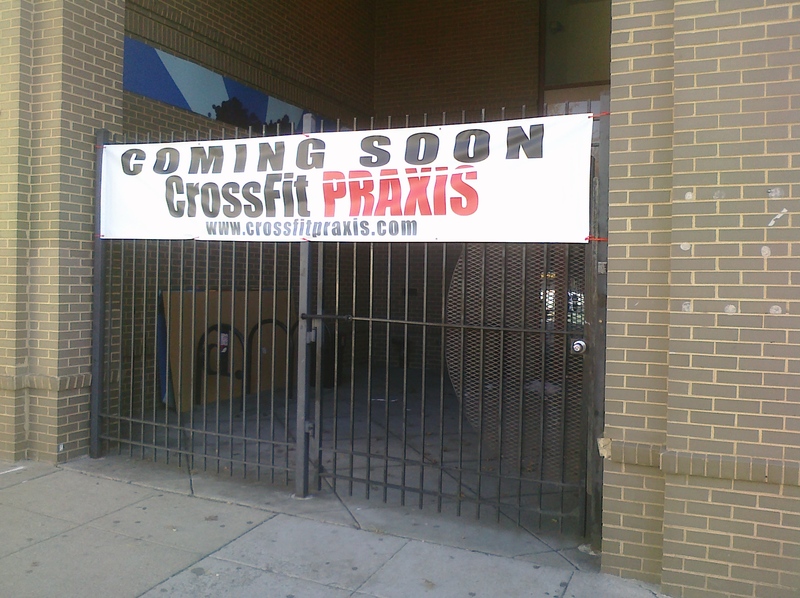 When I go in I usually get take out but this will definitely be a motivator for people to stay and eat in. Reading various tweets last night as this story developed was pretty horrifying: around 9 pm a car traveling south down 18th street tried to make a left onto Florida and instead hit the median and then crashed into 2 female pedestrians and the front of Keren Restaurant. The 2 pedestrians have serious injuries. One is described as life threatening. No further word on their conditions right now, I will update if more information becomes available. The driver of the car, also female, was arrested on pending charges. Luckily, no one was in the restaurant except the owner at the time of the crash, as it was closed. The owner is fine (but the front of the restaurant is not). DCist and James Calder have photos on the scene (warning, some photos could be disturbing as they capture a pretty hectic, scary scene). UPDATE: TBD is reporting that the driver, a 23-year-old from Mitchellville, MD, has been charged with driving while intoxicated more charges are pending and aggravated assault. The two pedestrians are still hospitalized. TBD has identified the driver as Chamica Adams. Last night I went in to try out Pica Taco, which opened on Sunday. With their 2 for 1 taco special their opening week, and tacos at $2.25 each, how could I not? 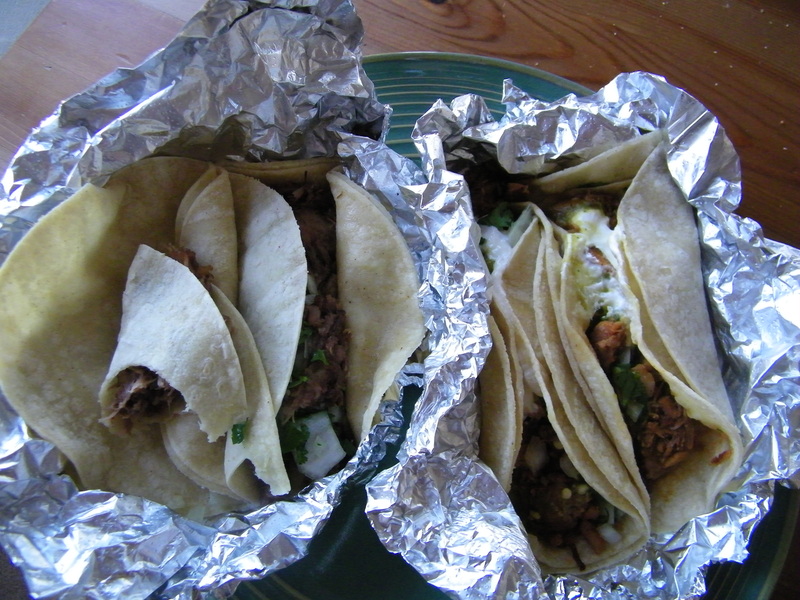 I got 2 barbacoa (beef) and 2 pastor (pork) tacos. Now, I will couch my opinions with, no I’m not from the West coast (sorry I’ve never been to California, unfortunately), so I can’t speak for the authenticity of the tacos. But I can speak to their deliciousness. They were both very good but I preferred the pastor: tangy, spicy, and just really savory. For some reason the pastor came with sour cream when the barbacoa did not. The barbacoa was good but I liked the pastor more. I also wasn’t sure why each taco came with two tortillas, perhaps it was to eat any meat that had fallen out of the first one? Because that’s what I did and it worked fine. Some other notes: if you buy 4 tacos you do not get 2 free. You just get one, which is a fair considering how cheap they are to begin with. I had 3 of my 4 tacos and could have easily eaten one or two more, so don’t expect to be full on a taco. Also, they’re not accepting credit cards now but hope to by the end of the week. The line was a bit long and slow around 7 on a Monday, but given that they just opened I expected it. Have you guys been? What do you think? 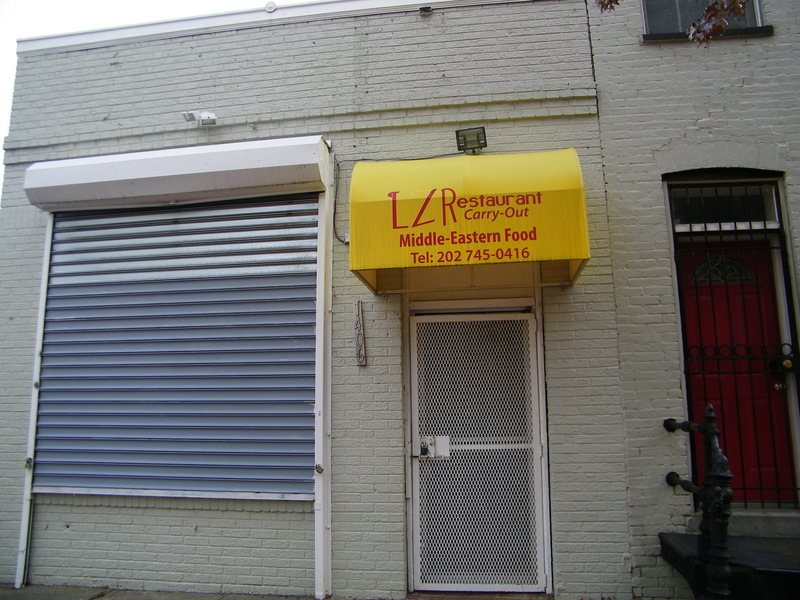 LZ Restaurant space to become a Mexican restaurant? Walking by I noticed some workers/ladders near the old LZ Restaurant space at 14th and Florida. A commenter on my post about it closing said as he was walking by he asked the workers what was going to come. They said there would be a Mexican restaurant. No details on the timeline or any other confirmation. So that’s the word on the street. According to MPD’s listserv (which you apparently need to be a member of to view the messages now – so sorry you’ll have to log in to see the post) there was a shooting at 11th and Florida/Sherman Ave around 4 am (I assume this morning). The victim is an adult male, and has been transported to a hospital. MPD provided no more information about his condition.